It's available as an e-book, Mudpuddle. I've become dangerously attached to the easy way you can download a book in seconds. Never thought I'd say that. :) But I don't and never will pay more than five bucks for an e-book. I'm still not sure they're ACTUAL books. Ha. Well I'm glad you decided to try this one out even if it left you wanting. I'll try to refrain from an argument with you about Basil knowing a lot about poetry. (Why can't he? Because he's a psychiatrist? Really? I know some doctors who know more about literature than I do! OK, enough.) McCloy is a favorite of mine for all the reasons you apparently don't like her books. Ah well... It would be a pity if this review turned off people who don't know her work. She happens to be one of the best of the American mystery writers of her time. She's better than Ellery Queen if you ask me. Oh, I don't think my review will turn anyone off, John. I'm wishy washy enough. :) There's just something about these American early and mid-century writers which leave me cold. Helen Reilly is another one. And Ethel Lina White and a couple of others. I've decided, in my old age, that Ellery Queen is just not as good as I remembered. Recently reread my favorite book of his, CAT OF MANY TAILS - but it was totally ruined by a dreadful ending. Some of Queen's books are unreadable. Sigh. None of these writers can hold a candle to Delano Ames or Rex Stout or John Dickson Carr. To my mind, very few early and mid-century American mystery writers come close to the Brits of that era. My own humble opinion. We should make a list, John. Agree. I couldn't get through a couple of the later books and just gave up. And reassessing some of the earlier stuff, there's very little I'd be interested in rereading. I still haven't tried anything by Helen McCloy in recent years, Yvette. I do think I should, just to see what I think. It surprises me that I don't find them at the annual book sale. Of course you should try them, Tracy. Don't mean to dissuade you. I'm a firm believer in giving everyone a try - even if it's only a couple of pages - ha! It's part of the adventure of reading. You may discover something in an author's work that I have totally failed to see. It happens a lot. I've never been bamboozled by one of your reviews, Yvette, good or bad. This one has intrigued me, yet given me sufficient caveat that McCloy is probly not my cup of tea, altho I also like the name "Basil Willing." Yeah, great name. Part of my 'attitude' is, I think, that with a name like that he should have been a memorable character. I guess I resent that he isn't. :) Try this one, Mathew, see what you think. I'd like your point of view on any McCloy book. I just might do that, Yvette! Helen McCloy is another new-to-me author. 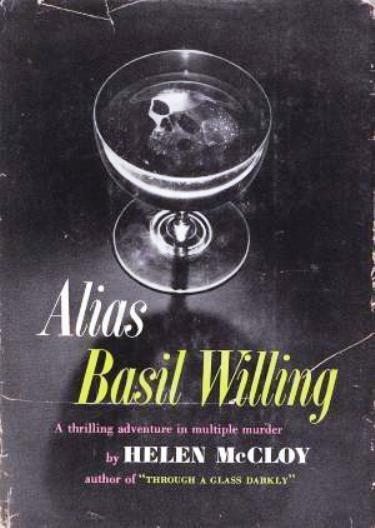 I love the cover and the premise of this novel, and I agree "Basil Willing" is a terrific name.